It’s already happened. 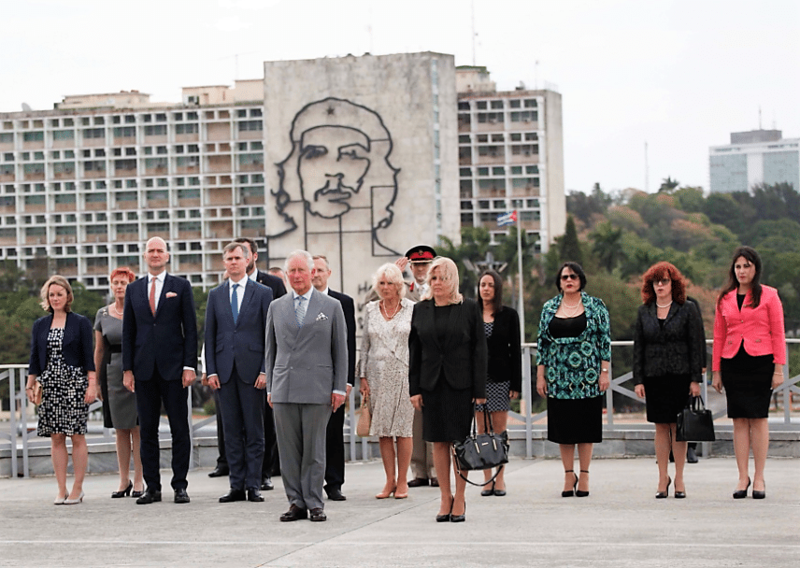 As of 5 p.m. on Sunday, His Royal Highness, Prince Charles had arrived in Havana accompanied by his wife Camilla, the Duchess of Cornwall to embark on an official visit at the request of the British government to strengthen bilateral commercial and cultural ties, thus instantly becoming the first British royal to visit Cuba since the triumph of the revolution (the last royal to travel to Cuba had been the Duke of Windsor, who travelled to the island twice in his lifetime, once in 1948 and one last time in 1955). Unlike his predecessor, the former King Edward VIII, whose trips to the largest of the Antilles were private Cuba holidays during which he and his wife, indulged in golfing, sumptuous dinners hosted in their honour and luxury stays at the Nacional de Cuba hotel, Prince Charles’ visit is an official one, and while he was indeed welcomed with a special dinner upon arrival, hosted by current Cuban president, Miguel Diaz Canel (in office since April 2018) he will attend to diplomatic matters mostly during his visit. For starters, throughout his three-day stay in Cuba (as part of his 12-day Caribbean tour), the Prince of Wales will be given a full tour of the city with the participation of the city’s, making an obligatory stop at the John Lennon Park that pays tribute to this British music legend while being moments steps away from El Submarino Amarillo, the ultimate Beatles’ inspired nightclub in the heart of downtown Havana. According to reports, Prince Charles will also tour a ground-breaking solar-powered energy plant, a project partly financed with British funds and which will see the light (literally) in December this year, instantly becoming the Caribbean’s largest power station of its kind. Seeing that climate change and sustainability are issues close to Prince Charles’ heart he will have plenty of opportunities for exchange on these topics while meeting Cuba’s new generation of eco-farmers. Allegedly, the Duke and Duchess of Cornwall’s Cuba itinerary also includes a stop by a salsa school, a performance from the Royal Ballet with leading Cuban-British dancer and CBE holder, Carlos Acosta and a meeting with a group of British classic car owners – if you thought American yank tanks were the only vintage cars roaming Cuba, well, Prince Charles’s Cuba visit will highlight the fact that Cuba is so much more than what you already know and expect! Prince Charles’ visit couldn’t come at a better time, now that Cuba is opening up to the world more than ever, welcoming foreign investment to boost its tourism industry and adjusting its economic model. The royal visit also happens just weeks after Cubans voted for an amendment to its constitution recognising private property for the first time in over half a century! And we’re also excited about what this warming of ties and fostering of Cuban-British relations and possibilities for cultural exchange could mean for both nations. The UK already sends over 200,000 tourists to Cuba each year, so if it this visit helps cement Cuba as an attractive destination not just for Britons but the entire world as well as give visibility to entrepreneurs like our owners of casas particulares in Havana and beyond, then we can only add that to our joy! As to what will Charles and Camilla’s accommodation in Havana be, we can most definitely rule out a casa particular in Havana but can only guess that they might stay at the same place that their British royal predecessors chose time and time, the emblematic Nacional de Cuba hotel, perhaps the best place in Cuba fit for a king given its history and not so much its luxury, as Havana has more modern and luxurious accommodation options nowadays – and yes, some of them include our swankiest casas particulares!